As the about me section for this blog says I'm going to turn myself into a bow weilding elk hunter I can't blame any of you who are tapping your fingers and demanding "enough of the kit collecting and distractions, get with the hunting already". So in the interests of getting on with it I thought a review of the european options for the hunting toxophile would be in order. 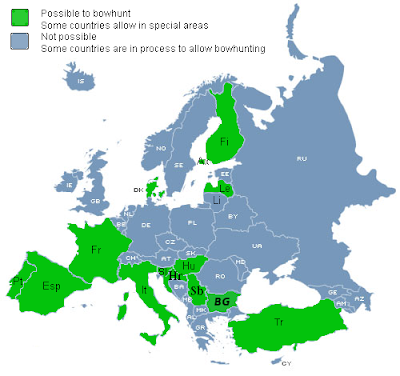 As you can see from the map, bowhunting is really starting to gain popularity in southern Europe, the summer before last the French hunting magazines all had bowhunting sections and CHJ has found severl Italian bowhunting sites. The European Bowhunting Association has some useful information, if you're thinking of making the trip. I'm off to Italy in a few days to do some outdoor plumbing and some scouting for big pigs in a chestnut forest.